Lulu Lemon makes an excellent backpack. I used it for the first time yesterday traveling from Washington DC to Frankfurt. The bag is a good size and has tons of pockets. 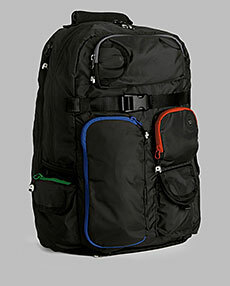 The beauty of the bag is that each pocket is well thought out and color coded for phones, ipods, cables, wallets, keys etc. Each pocket has a magnet that closes the pocket easily and without a fuss. The bag also has a padded strap making it very comfortable to use. It also includes a separate pocket for a laptop that is well padded. Overall the bag gets 5 Stars.